IVLP Alumnus Arun Krishnamurthy speaks to a group of students at GT Aloha Vidhya Mandir school on the importance of conservation. Arun Krishnamurthy, a passionate environmentalist and alumnus of the International Visitor Leadership Program, quit a promising career at Google to pursue his true passion—conservation. In 2011, he founded the Environmentalist Foundation of India (EFI) and has received national and international recognition for making strides restoring lakes, recycling waste, and promoting green practices across India. At age 25, Arun received the prestigious Rolex Young Laureate Award for Enterprise in 2012 for his ongoing work to restore Kilkattalai Lake in Chennai. One of the most inspiring aspects of EFI’s organizational model is its foundation in youth activism. EFI is comprised entirely of volunteers, students aged 11-18. 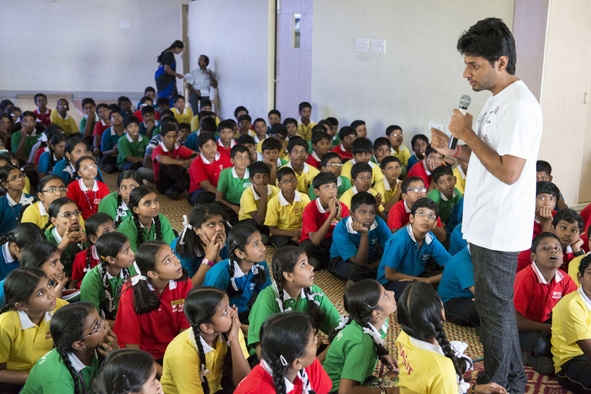 By engaging young students, Arun is able to identify young Indians passionate about the environment and give them the space to make a real difference in their communities. Through EFI, student volunteers have led dozens of lake restoration, beach clean-up, plant restoration, animal rescue, waste management, and recycling initiatives. To date, EFI has cleaned 17 lakes across India, five in Chennai. EFI continues to make a splash in the media, as they expand their partnerships with India’s top stars. In November 2014, leading Tamil film star Kamal Hasan celebrated his 60th birthday by partnering with EFI on a lake cleaning project outside of Chennai city in the spirit of Indian Prime Minister Modi’s “Clean India” (Swacch Bharath) campaign. Another South Indian film star, Ms. Trisha Krishnan, a Global Ambassador for PETA, also partnered with EFI to launch a local animal shelter restoration project. With more than 900 youth volunteers, Arun and EFI continue to channel the passion and service of young Indians to protect, restore, and sustain the environment, as a model not only for India but the world.